Bookburners: “Man About Town” by Andrea Phillips. Season four, episode 4. So… what now? The big plot arc of the last few weeks has been resolved, and Team Three doesn’t have any pressing goals. I mean, besides the general, “save the world” thing, which it’s hard to come up with a concrete plan for. 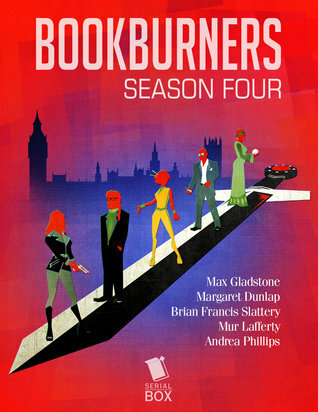 Oh, and of course, from here on out there will be spoilers for previous episodes of Bookburners, a serialized urban fantasy novel created by Max Gladstone. Which leads to one of the more interesting parts of the episode: London itself. As you probably remember, at the end of the last season, London became Ground Zero for the largest magical incursion the world has ever seen. London has been fundamentally changed as a result, and there’s no hiding magic from the people who live there. While there’re hints at future plot lines, “Man About Town” is a quieter story, focusing on the characters and world. It’s primarily focused on Liam, having him acting individually and discovering other ways to help people deal with magic. However, there is another twist as well, one that’s frighteningly important… but not something I can reveal without spoilers.